Wardrobes are probably something you cannot imagine your house without. It keeps away your house from looking messy. While the wardrobe is very important storage solution that can look great, the way it is made is even more important. The number of drawers and sections, space, material of the wardrobe these are all the things which should be taken care when you are going to buy a one. In order to avoid compromising on what you really want and what is available to buy in a shop we offer you the option to have a truly bespoke made-to-measure wardrobe. Our experienced team will take care of your ideas, wishes, needs and preferences to do our best to make sure you get the wardrobe that is created according to your own sense of style and comfort. If you want to give your room or house a traditional look then made-to-measure traditional spray-painted wardrobes might be the best option. 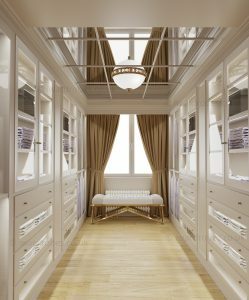 Custom traditional closets can add the style and sleek look to any room no matter if it is a fitted bedroom, reception wardrobe or bespoke living room unit with TV stand. Our aim is to make the furniture which fulfils customers size, quality, style and design demands. Changing the awkward shaped room or a loft to a cozy space with a custom traditional closet is something we aim to achieve. Bespoke wardrobe can increase the storage space in the room. Shaker style wardrobes are the great solution if you want to add the traditional look to your home. With custom made shaker style wardrobes you can mix and match mirror, frosted and coloured glass, bright, dark and light colours.